Continuous processing, already conventional in many manufacturing fields, has been establishing itself in biopharma, which is starting to realize continuous processing’s compelling advantages: enhanced product quality, greater efficiency, and rapid scalability. To help biopharma incorporate continuous processing methodologies, Applikon Biotechnology provides a range of solutions: compact bioreactors; perfusion and cell separation systems; and advanced and highly scalable control systems, which are needed to automate and closely monitor continuous processes. Although most biopharmaceutical production continues to be based on batch-fed processes, continuous processing, largely via perfusion, is rapidly gaining traction. Amgen, Genzyme, and many other leading biotech producers are now pursuing technologies that streamline biopharmaceutical manufacturing via system-wide use of continuous processing. In biopharmaceutical manufacturing, continuous processing is based on bioreactors running on continuous cycle as opposed to “batch” production, where a specific quantity of drug is produced in a tank during a single discrete manufacturing cycle. Where production-scale batch processing tends to feature large bioreactor tanks (10,000 L or more), continuous processing emphasizes smaller bioreactors continually feeding media to specialized chromatography processes, which separate the product from the surrounding liquid. The major advantages of continuous processing are lower equipment costs and smaller quantities of cell media, leading to a reduced overall footprint, eliminating redundant holding containers and clarification systems. Continuous processing also delivers the benefits discussed below. Product quality is enhanced because media nutrients are constantly maintained and because cells don’t experience the drop-off or lags that are often encountered at end of a batch run. Further, processing delays are greatly reduced as product constantly flows from one step to the next, eliminating major causes of product degradation and contamination. Scalability is becoming a key industry issue as drug shortages become of higher concern to regulatory bodies such as the U.S. Food and Drug Administration and the European Medicines Agency. Since continuous processing production is primarily governed by durations rather than volumes, production can simply be ramped up by extending campaigns and incorporating additional compact continuous processing units. Continuous processing also supports easier technology transfer, since the systems used in laboratory R&D tend to the same as those employed on production floor. Continuous processing enhances profitability in two ways: 1) by allowing more efficient and economical facility design and utilization, and 2) by reducing the cost of goods through reduced footprint and lower media and energy consumption, enabling increased automation with consequent reduction in service requirements and operator time. Although few approved biopharmaceutical manufacturing processes currently use continuous processing, that does not mean a switchover is particularly problematic. Many existing and GMP-compliant biopharmaceutical manufacturing processes are inherently compatible with fully continuous processing methodology. One reason for the easy fit is the current use of perfusion bioreactors. In perfusion mode, the culture is maintained over much longer periods by continuously feeding the cells with fresh media and removing a fraction of the spent media and soluble product. Perfusion cell culture is well tested within the biopharma industry. Evaluations of perfusion cell culture go back to the early 1980s, when the technique was introduced as a means for improving the productivity of cell culture processes and safely capturing unstable/labile proteins that degrade under batch and fed-batch process conditions. Now increasing interest in continuous processing for biotech is shifting attention to perfusion’s inherent advantages for upstream cell culture processes. This transition is being unlocked with further developments in automation and in processes downstream of the perfusion bioreactor system, where protein can in theory be continuously separated from the steady stream of harvested liquid media. The major challenges in adopting continuous processing concern new in-process testing and release approaches, along with the need to adapt more robust and adaptive closed-loop control systems. New solutions being developed in the area of perfusion include ChromaTan’s patented Continuous Countercurrent Tangential Chromatography (CCTC) technology, which overcomes many of the limitations of batch columns without the drawbacks of multicolumn systems. The CCTC platform is a true moving bed technology that runs at steady state without utilizing columns. The novel design of the system enables short residence times, consistent product concentration and quality, as well as easier implementation of advanced process analytical technology and process control. The CCTC system includes all of the traditional chromatography steps such as bind, wash, elution, strip, and regeneration, but these operations are conducted on a moving slurry instead of a packed column. Each step is made of multiple stages arranged in a countercurrent configuration, and each of these stages incorporates a static mixer and a hollow fiber membrane module. In a CCTC process, the resin slurry flows through these modular stages, while all of the chromatographic operations are performed simultaneously and at steady state (Figure 1). The CCTC system has been shown to operate continuously with 5–10× greater productivity vs. batch columns, enabling a significant reduction of resin volume compared to batch column requirements. In Phase I of an NIH grant, ChromaTan teamed up with Applikon to produce a commercial monoclonal antibody. 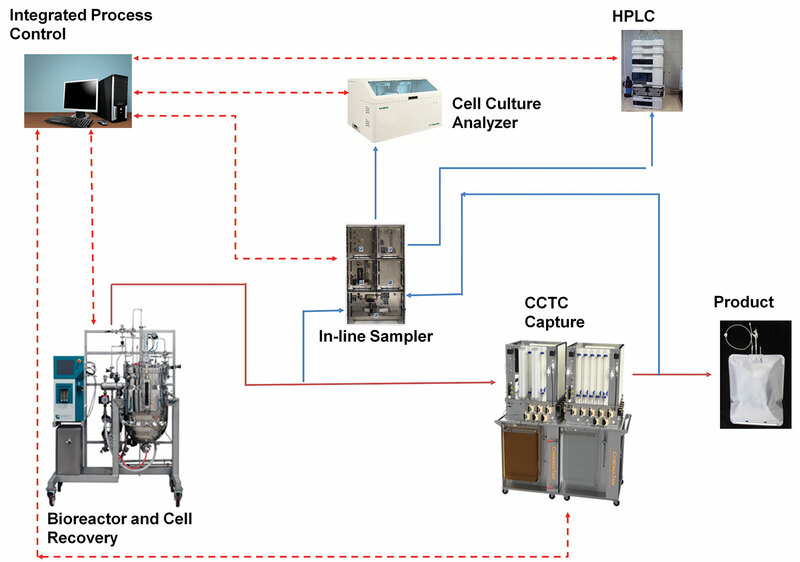 Experiments were designed to demonstrate effective use of a perfusion bioreactor run for long-term CCTC hydrodynamic testing and CCTC purification testing. An Applikon 3-L bioreactor system, including the ez-Control and BioSep perfusion device, was used to perform the bioreactor run. High cell density (50–60 × 106 cells/mL) was obtained and maintained for ~30 days (Figure 2). 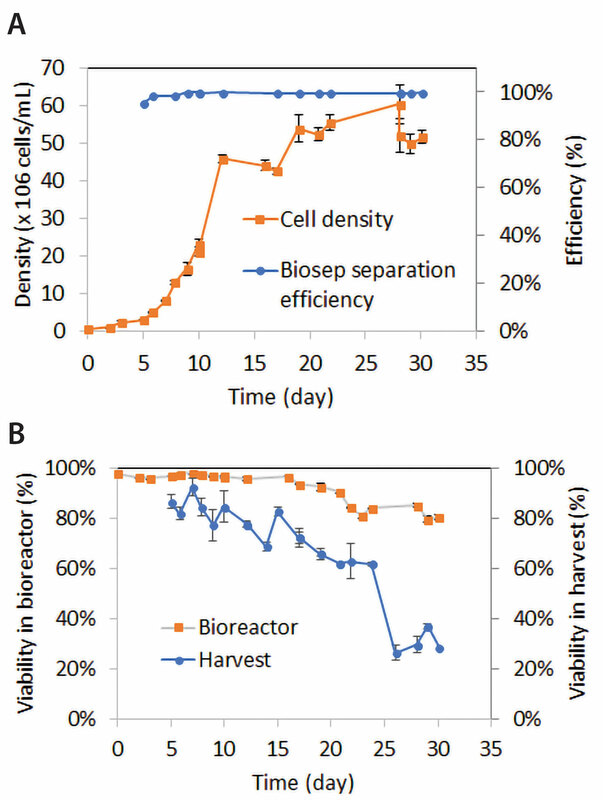 The test results obtained with the BioSep device demonstrate the suitability of this technology for long-term, continuous perfusion with the added benefit of improving the quality of the cell culture by preferentially removing dead cells. Figure 2. Cell density (A) and viability (B) data from a ChromaTan/ Applikon study. High cell density (50–60 × 106 cells/mL) was obtained and maintained over ~30 days. Erik Kakes (e.kakes@applikon-biotechnology.com) is international sales and marketing director at Applikon Biotechnology.